The spring equinox has now come and gone, opening the latest 'melt season' in the annual cycle of the Arctic sea ice. But this spring is different from the thousands of springs that have come and gone as humans began to settle in cities, grow crops in the country and create kingdoms and complex religious establishments. This spring follows a remarkably low fall minimum--one that has observers of the ice paying very close attention indeed. What will the record low mean for the future? 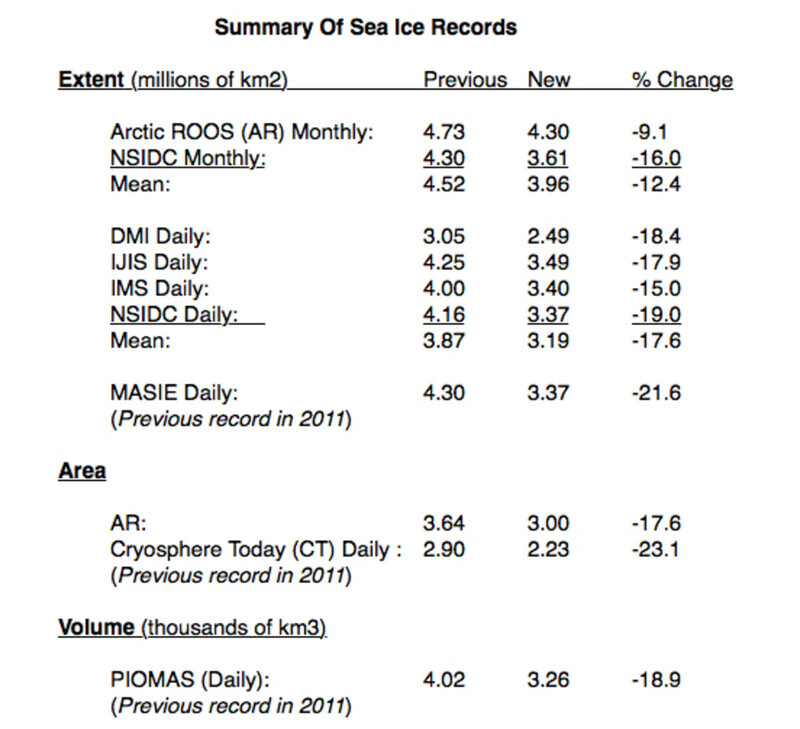 NSIDC FAQs index; select "What is the difference between sea ice area and extent?" The Records--How Bad Was It? The sea ice volume, shockingly, was down roughly 76%. But, as we now know, previous records were thoroughly eclipsed this September. 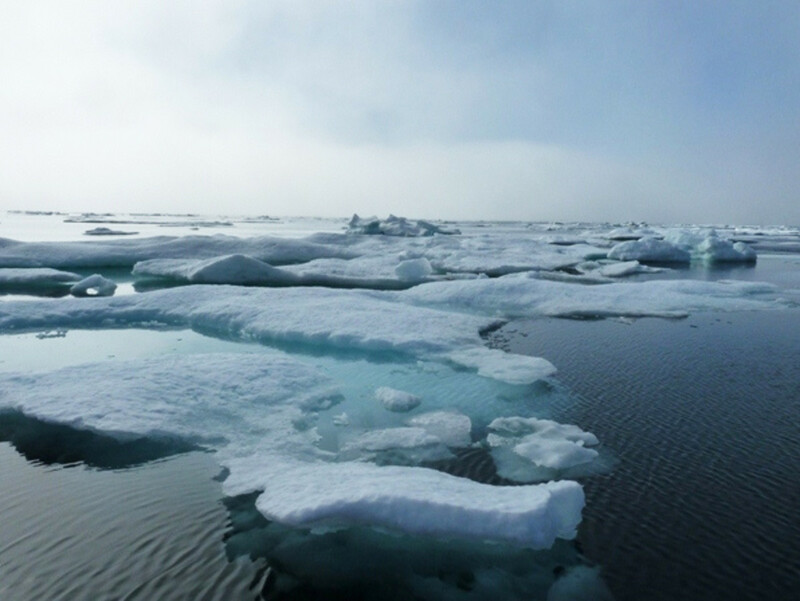 An increasing number of organizations have begun to provide data on the sea ice. They include the Arctic ROOS, a European consortium; the American National Snow and Ice Data Center; the Danish Meteorological Institute; IJIS, a Japanese-American collaboration; IMS, from the US National Ice Center; MASIE, also from NSIDC; Cryosphere Today, at the University of Illinois at Urbana-Champaign; and PIOMAS, at the University of Washington. For MASIE, CT and PIOMAS, the previous record came from 2011; in all other cases, the record was from the 'death spiral' year of 2007. Here is a summary of 10 different measures, their previous and new records, and the percentage change the new record represents. Table by author. Data sources in appendix below. The smallest change is in the Arctic ROOS monthly extent record, which declined just over 9%. The largest is Cryosphere Today's daily area, where the decline was over 23%. (In general, monthly values should decline less than daily ones, and extent values less than area values.) The PIOMAS volume is down nearly 19%, which is fairly close to the various daily extent changes as well. So: in one case, a tenth less extent than the corresponding month in 2007; in another, almost a quarter less area than the lowest day in 2011; but a sixth less or so in most measures, including the crucial measure of ice volume, PIOMAS. It's fair to say that the previous records were decisively shattered. To put this in a larger context, here are graphs of the evolution of extent, area, and volume over the span of the satellite era. 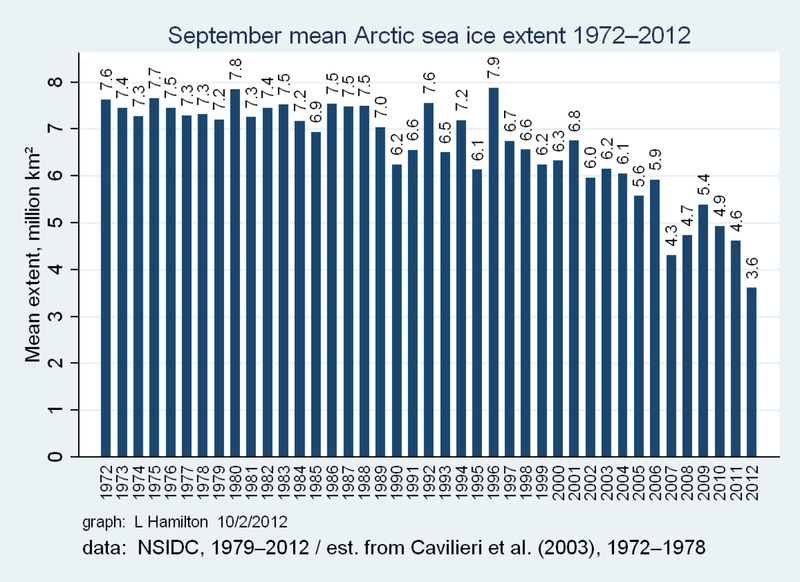 Arctic sea ice extent graph, courtesy of Dr. L. Hamilton. NSIDC annual minimum data. Sea ice area graph for both Arctic and Antarctica area, courtesy of Dr. L. Hamilton. 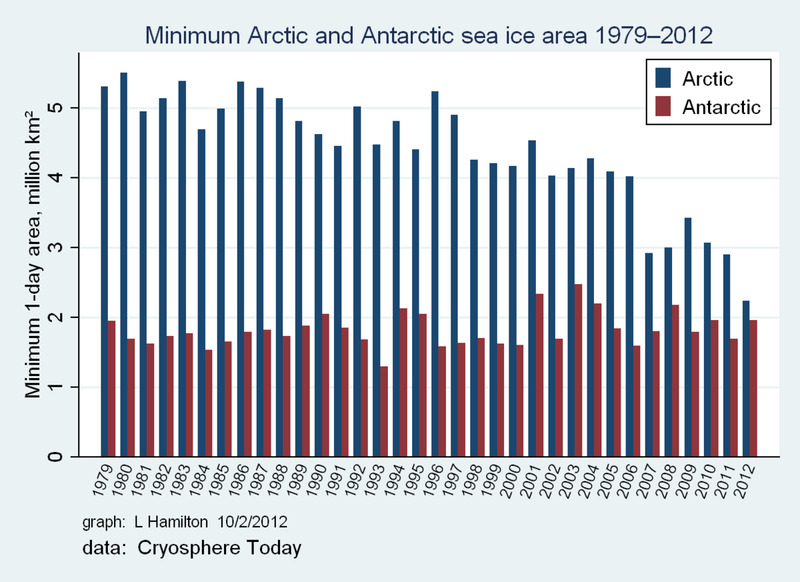 Cryosphere annual minimum data. 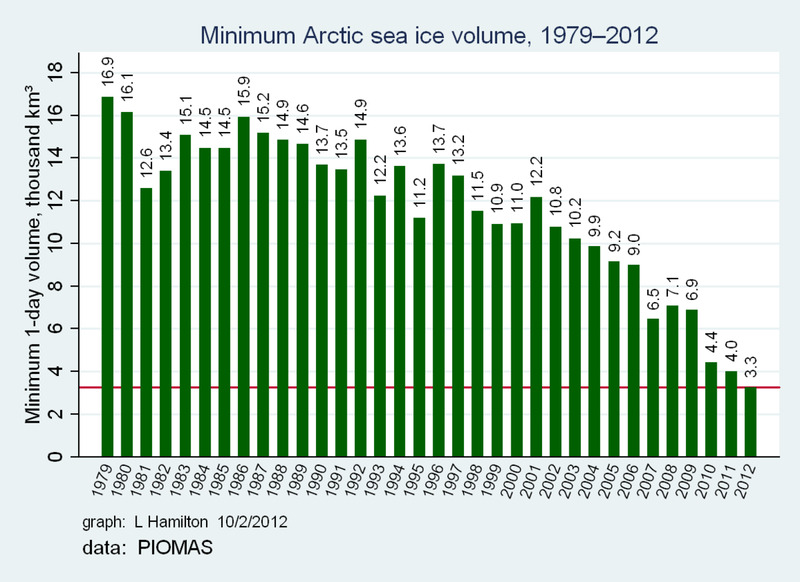 Sea ice volume graph, courtesy of Dr. L. Hamilton. PIOMAS model annual minimum data. But what are the political and social effects of this? Are people noticing, and if so, what are they thinking? What is being said about it? Is it sparking new research? Perhaps more importantly, what are the meteorological effects? Biological effects? Icy Vista. Photo courtesy NASA and Wikimedia Commons. Well, people did notice. Following the record minimum, a Google search of the terms "arctic sea ice records 2012" turned up 5.9 million hits. News stories were plentiful in the print media and online, with news giants like the New York Times providing numerous articles. On the other hand, a small survey by MediaMatters contrasted TV coverage of Arctic Sea Ice Loss with the coverage of Vice Presidential candidate Paul Ryan's workout routine. 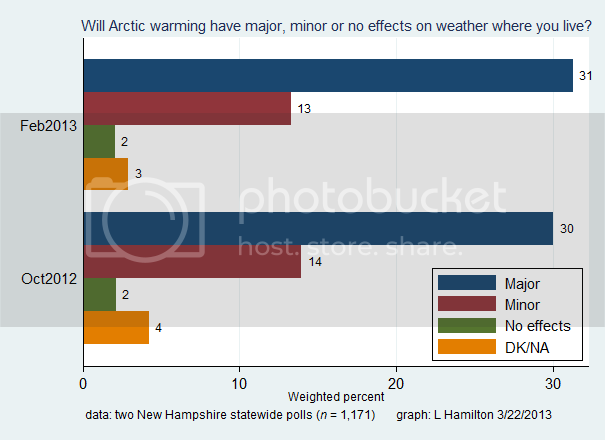 The latter was discussed 66 times on ABC, CBS, NBC, CNN, Fox News and MSNBC, while the sea ice merited just 20 mentions. On cable news, the ratio was even worse, with Ryan outpointing the Arctic 53 to 8--and of the 8 mentions, 1 (unsurprisingly, on Fox News) was misleading in that it downplayed the extent decline by conflating regional and pan-Arctic ice conditions. And only two networks, NBC and MSNBC, mentioned the connection between the ice decline and human GHG emissions. As the winter continued, the ice extent increased rapidly, as most observers expected--open water in the Arctic winter is still basically an invitation for ice to form--and there had been lots of open water in September. A few denialist blogs tried to paint this as a meaningful 'recovery' of the sea ice, but seemed to gain little traction. The ice extent remains very low, but not in record territory--the National Snow and Ice Data Center reports that February saw the seventh-lowest extent in the satellite record. Lest this seem like recovery, it should be mentioned that current extent is below last year's, which was relatively high--nearly 'normal,' in fact. But that 'high' February extent didn't stop a record decline in 2012. Sea ice off southwestern Alaska. Photo courtesy NASA Earth Observatory and Wikimedia Commons. Article abstract, Francis & Vavrus, 2012. The text of Barnes & Hartmann. Highly technical. spacedaily.com article on Petouknov et al. Good summary for general public. Abstract of Petoukhov et al. Quite a few science stories have emerged, which I've organized under several research theme headings. Perhaps the most potentially significant is the question of atmospheric circulation and Arctic warming--intimately connected to sea ice extent. During late fall of 2012, Dr. Jennifer Francis of Rutgers was drawing a link between Arctic warming and changes to the polar jet stream. These changes could result in 'stuck' weather systems and thus to persistent weather conditions, raising the probability of extremes in precipitation or temperature or both. The question was investigated by several investigators during 2012 and 2013, to results that are not yet entirely clear. So-called 'blocking events' may increase in general, or their spatial structure may change--for example, Dunn-Sigouin & Son, 2013* finds slight decreases in blocking events over the northern Atlantic and Pacific oceans, but a small increase in such events over eastern Europe and Russia. The most recent study, Petoukhov et al, 2013, find a mechanism linking warming to such extreme events as the deadly 2010 Russian heatwave. It is slow to load, however, which makes it show up as a bad link in the Hubpages software, preventing its inclusion in the sidebar with the other papers mentioned. Nicolaus et al, 2012 abstract. Of interest in diagnosing the future evolution of the sea ice is Nicolaus et al, 2012. It considers melt pond formation over first-year Arctic sea ice. First-year ice is flatter and smoother than older, multi-year ice, and hence much more prone to the formation of a great many shallow melt ponds. Nicolaus et al sent a remote submersible under the ice to measure the light transmitted via these ponds. The result might be surprising to many. "The young thin ice with the many melt ponds does not just permit three times as much light to pass through than older ice. It also absorbs 50 per cent more solar radiation. This conversely means that this thin ice covered by melt ponds reflects considerably fewer sun rays than the thick ice. Its reflection rate is just 37 per cent. The young ice also absorbs more solar energy, which causes more melt. The ice melts from inside out to a certain extent," says Marcel Nicolaus. For unknown reasons, this link is showing up as a bad link in Hubpages software, but appears to be functioning correctly nonetheless. "Ponds on the ocean." ICESCAPE investigators work Arctic Ocean melt ponds, July 2011. Photo courtesy NASA and Wikimedia Commons. A couple of studies have also connected biology with sea ice loss, either directly or indirectly. Abstract, Arrigo et al, 2012. Abstract, Boetius et al, 2013. Arrigo et al, 2012* showed massive phytoplankton blooms occurring under the sea ice. It is believed that the thinner ice characterizing the 'new Arctic' is facilitating such developments. Boetius and her team warn: "We still understand far too little about the function of the Arctic ecosystem and its biodiversity and productivity, to be able to estimate the consequences of the rapid sea-ice decline." Atwood et al, 2013, sciencedaily story. 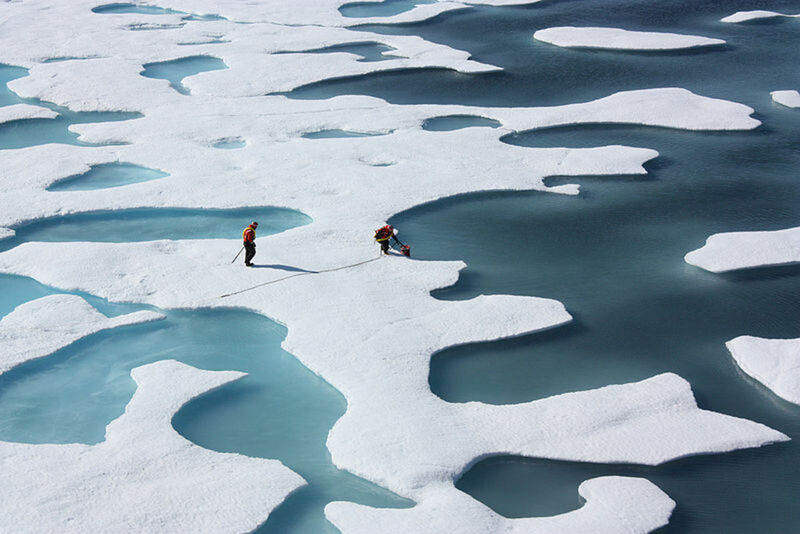 Sea Ice Loss 2012: What Do The Records Mean? Labor Day 2012 saw shocking new record lows for Arctic sea ice--and the records continued dropping. Here's the larger context, and why you should care. 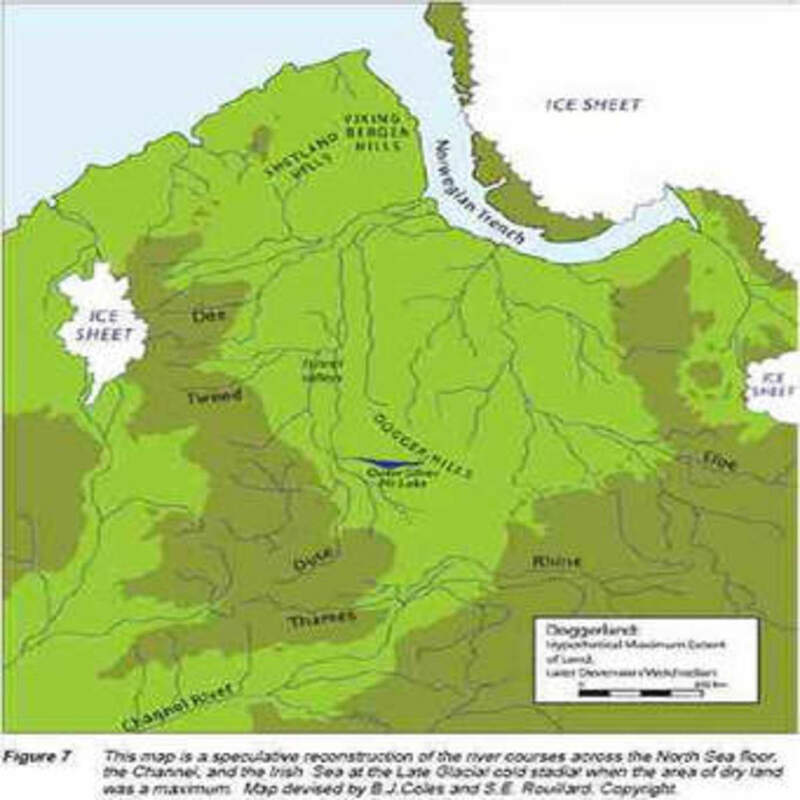 Trisha Atwood, of the University of British Columbia, and her colleagues showed experimentally that the loss of top predators in an aquatic environment can indeed affect the functioning of the whole ecosystem, "all the way down to the biogeochemical level," as Ms. Atwood put it. In the study in question, the removal of top predators resulted in 93 percent more carbon dioxide being emitted into the atmosphere. The sea ice is in itself a wildlife habitat. Its loss will be devastating for polar bears and seals, as well as less charismatic creatures depending on it. We cannot yet predict everything that a serious population crash of bears and seals will do, but consequences there will be. Yet another study addressed the question of the survival of sea-ice-dependent crustaceans called 'amphipods.' They are similar to shrimp, and their habitat is the underside of the sea ice. How, then, will they fare in a world where sea ice becomes merely seasonal? But an international group of researchers have found that one species, at least, has a strategy to deal with ice loss: the amphipods migrate downward and ride deep ocean currents northward to recolonize any remaining ice. (The researchers dubbed this the "Nemo hypothesis," after the Disney movie in which a similar strategy was employed.) This behavior avoids export from the Arctic into the Atlantic when sea ice is 'flushed' southward via the Fram Strait. 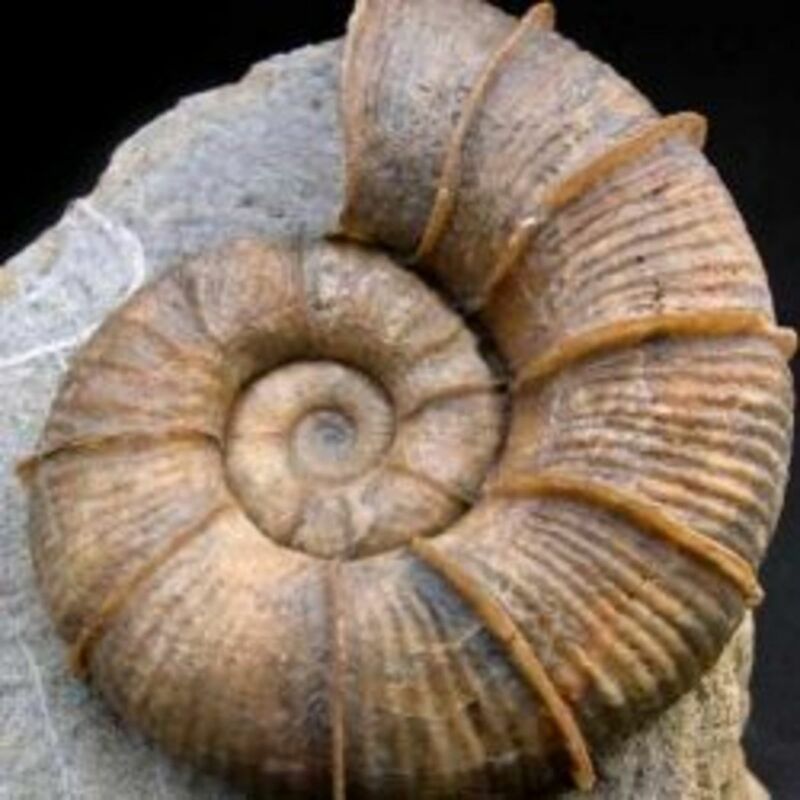 But it may also reflect the evolutionary experience of past geologic eras when sea ice was low. J. Berge et al. Retention of ice-associated amphipods: possible consequences for an ice-free Arctic Ocean. Biology Letters, 2012. 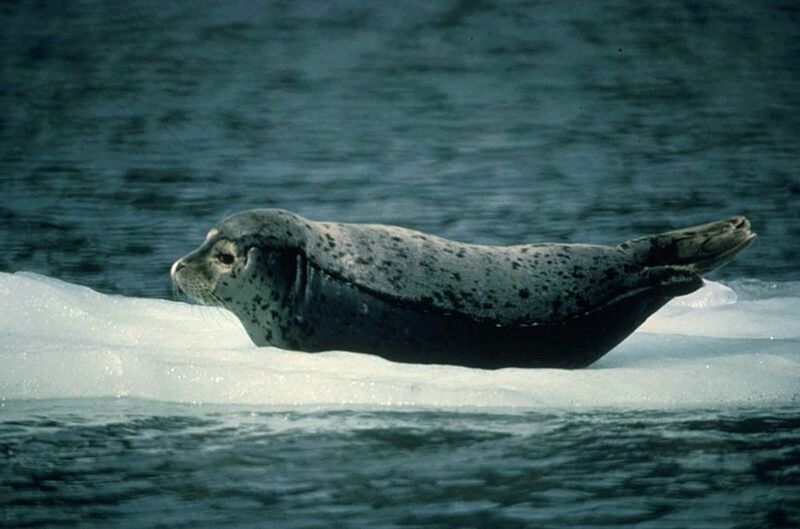 Harbor seal on ice. 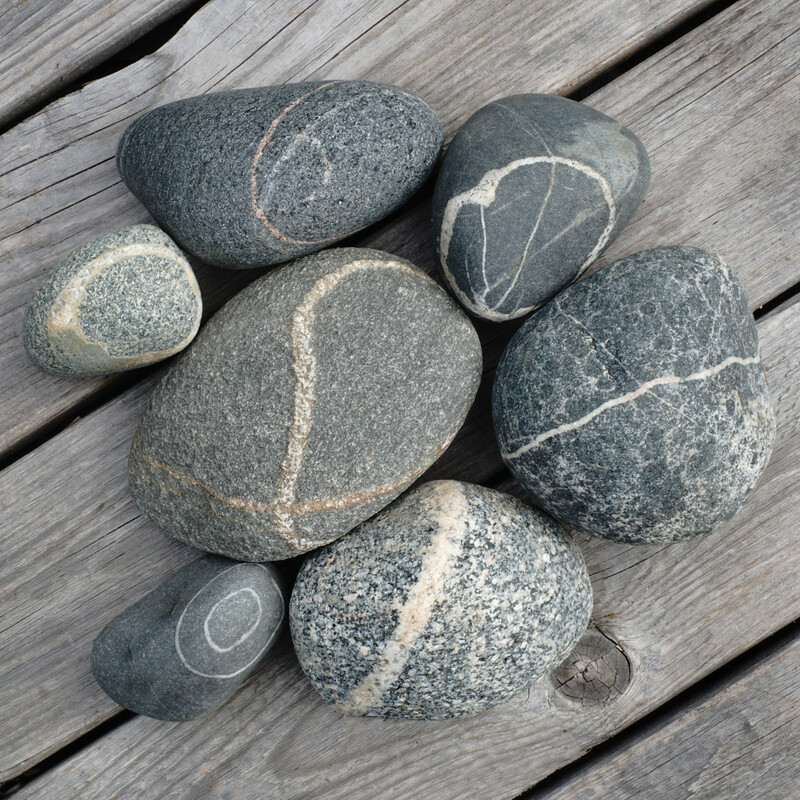 Photo by Sue Mattews; image courtesy photographer and Wikimedia Commons. Researchers studying the mental health and well-being of Inuit populations in coastal Labrador say rising temperatures are having damaging psychological effects on people in traditional communities. Arctic sea ice loss is a leading factor. What will this season show? Truly, no-one yet knows--that is the fascination of observing this Earth System tragedy as it unfolds. Although the medium-term trend is clearly that of the "death spiral" that Dr. Walt Serreze of the National Snow and Ice Data Center described, the specific weather events of each season still have a strong influence over just how the ice melt unfolds--and just how bad it gets. Yet the 'citizen scientists' of the Arctic Sea Ice Blog--whose corporate track record is as good as anyone's these days--seem, well, guardedly pessimistic. Although sea ice extent has made its usual seasonal recovery, climbing from record low extents to seventh-lowest for the month of February, 2012 showed clearly what was already known: maximum extent does not have a strong predictive value for the subsequent ice minimum six months later. So we should not be particularly encouraged by this rise--relatively modest in any case. Slightly more encouraging, perhaps, is the rise of the sea ice volume--after all, it's the mass of the ice to be melted that is important, and volume is directly related. According to the University of Washington PIOMAS model, the ice volume just barely crept above the 2012 value during February. But considering last year's trajectory, and the likelihood that we have reached the yearly maximum, it's a good bet that the relationship will quickly reverse once again. Ice Volume (monthly values.) Image courtesy University of Washington. But the difference is not likely to be very significant. The high proportion of first-year ice may well be more decisive. Another portent--though a somewhat ambiguous one--is the very extensive cracking observed last month. It has been considered quite closely on the Arctic Sea Ice blog, and noted as well on the NSIDC site. Some suspect that it may enhance melting, but that remains speculative--albeit reasonable--at this point. It's interesting, to be sure--as with so much about the sea ice situation now. What will happen? 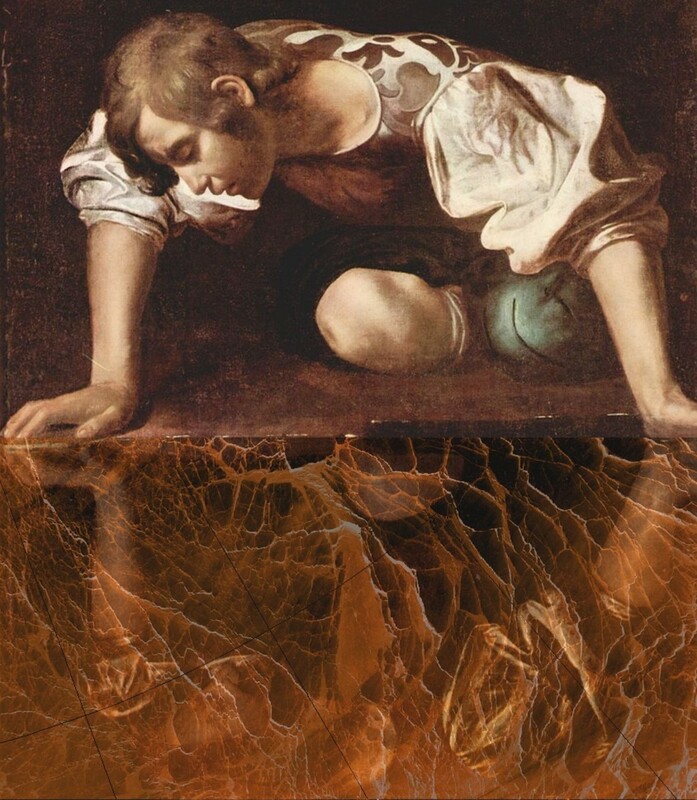 "Narcissus" by Caravaggio (1595), modified by "A-Team." 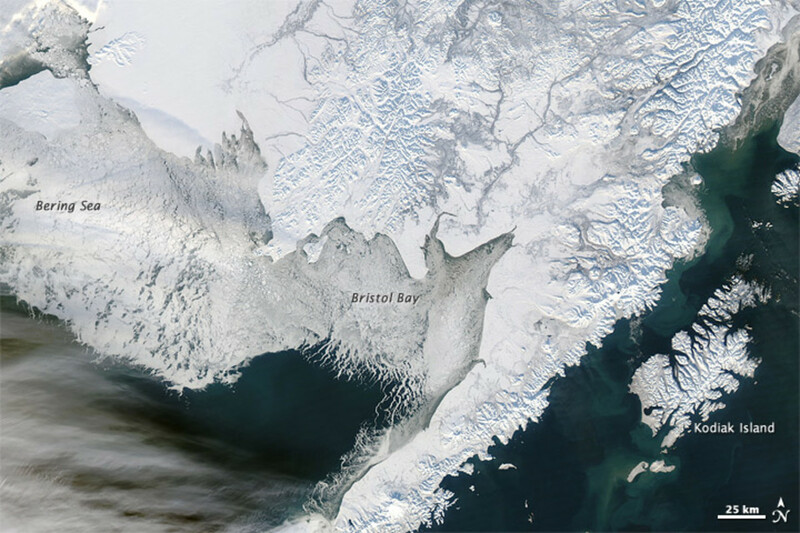 The reflection is overlaid with the February 2012 sea ice cracks, as imaged from orbit. Narcissus has broken his mirror... Image courtesy A-Team. Arctic ROOS: The Arctic Regional Ocean Observing System, a consortium of "14 member institutions from nine European countries," existing to "promote, develop and maintain operational monitoring" of relevant measure of Arctic health following the end of the International Polar Year. NSIDC: The National Snow And Ice Data Center, "part of the Cooperative Institute for Research in Environmental Sciences (CIRES) at the University of Colorado at Boulder," supported by "NASA, the National Science Foundation (NSF), the National Oceanic and Atmospheric Administration (NOAA), and other federal agencies, through competitive grants and contracts." DMI: The Danish Meteorological Institute's Centre for Ocean and Ice "provides information about the state of the sea at present, and for the near future," including services such as "surge warnings, ice charting, waves, ocean currents, satellite surveyance, ocean climate and marine data." IMS: The "Interactive Multisensor Snow and Ice Mapping System," a program of the National Ice Center, "a tri-agency operational center, operated by the National Oceanic and Atmospheric Administration (NOAA), the United States Navy, and the United States Coast Guard." It prepares a daily ice chart intended primarily to guide marine operations of the Navy and Coast Guard, but also summary information which "can also be [used for] climatic studies." A 'money quote' from the latter: "MASIE gives a quick picture of ice extent that is more accurate than the daily Sea Ice Index product and allows users to compare day-to-day changes in extent values. However, in general, it would not be appropriate to compare a recent MASIE extent value to one more than a few weeks old because the data sources and analysts NIC uses may have changed. Only the data for the most recent four weeks is maintained as publicly available. CT: "Cryosphere Today" is the website of the Polar Research Group within the Department of Atmospheric Studies at the University of Illinois at Urbana-Champaign. Their data is obtained from NSIDC, but they make area--rather than extent--numbers publicly available. PIOMAS: The "Pan-Arctic Ice Ocean Modeling and Assimilation System," a project of the "Polar Science Center", "a department with the Applied Physics Laboratory at the University of Washington." 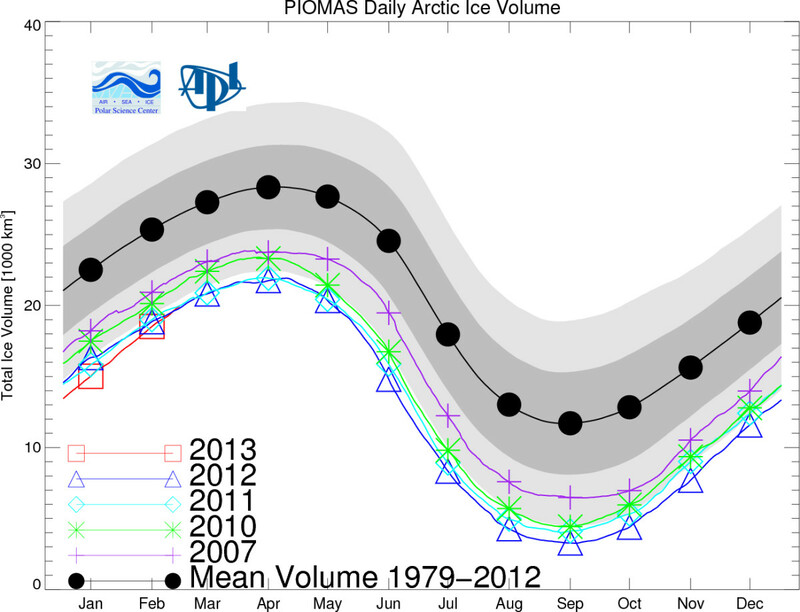 PIOMAS has been the only publically-available near-real time information on sea ice volume. Strictly speaking, it should probably not be called 'data,' since it is based upon a "reanalysis"--that is, modeled, rather than directly observed, ice thickness. The model does, however, "assimilate" available relevant data on an ongoing basis. Recently released analysis of satellite data from the new Cryosat 2 program strongly suggests that PIOMAS is modeling sea ice accurately. And for volume, it is still the "only game in town." "Responsibility," or "Driver, Boy and Girl"
A short story about responsibility, school buses, history, and burnings big and small. . . "Afternoon on a warm spring day in central Ontario, with a school bus dragging a dust plume up and down the county roads..."
We depend upon the 'fire' of solar radiation for our very lives. But how intense is this fire? Does it change? Here's the story of these questions and their answers--and of the people investigating them. Claude Pouillet rose from obscurity to become a scientist, educator and legislator. He was the first to make a reasonably accurate estimate of the so-called "solar constant." Read about his dramatic life here! Thanks, Sebastian. Your prediction about the skeptic reaction is undoubtedly correct: indeed, during the freezing phase of the year there was some hooha about speed and extent of the refreeze on the part of some of the usual suspects. So, yes, should the minimum of 2013 turn out a tad higher than that of 2012, we'll surely hear some fuss about it. But doc, don't you realise its chilly outside so it must all be a hoax? Seriously, this is an excellent and comprehensive piece - you could mention the role of albedo as a feedback in the climate system which explains why extent is an important measure. As for predictions: reversion to mean suggests that 2013 won't be as bad. And I therefore confidently predict that, if this is indeed the case, those self-identified "sceptics" who in fact never seem to question sceptically their own myths will trumpet a "recovery". More than that, they will point out then that, recovery on recovery, there will be more multi-year ice in 2014 than in 2013! (Lest you feel I'm too cynical, head on over to WUWT: it was the weatherman's stuck record from 2008-2011 and I doubt he'll miss a beat, 2012 just won't have happened). By the way, it is worth pointing out too that the sinking biomass (which I look forward to investigating) would have to sequester an awful lot of carbon to make up for the loss of albedo. And excellent comment! Thanks for the thoughtful response, Ryan. Some folks look at all these uncertainties and say "Well, we don't *know*, so we might as well press ahead with what we were doing." Others look at it and say, "Well, we don't know. Wouldn't it be smart to slow down a bit, at least, until we have some indications that it really *is* safe?" I'm looking forward to checking out your link! Nice collection of hard data with interesting insights. I wanted to make a note about the article relating to the loss of apex predators in freshwater aquatic systems, and that in marine systems near the Arctic the effects would cause serious trophic cascades on levels we would be unable to predict. Important to note that in such a vast ecosystem the carbon emissions based on the loss of 1-2 species in the Arctic and how much more carbon is being emitted is more than likely unmeasurable, but the probability of it being at any significant levels is minimal. If your looking for more information I've added a link to the end of my comment that talks about trophic cascades and touches on one of the most recognized examples in the Aleutian Islands, which lies in the middle of the Bering Sea. Excellent Hub. Thanks for pointing out that omission, conrad! Yes, that would be the URL. I'll have to add that in somewhere as I get the chance. Yes, I expect rather a wild ride--not that I claim any originality for that thought! Nice piece of work, by the way, but what is coming next, is what will change a lot! Thanks for the suggestion, Espen. How about "that remains speculative--albeit reasonable--"? Some suspect that it may enhance melting, but that remains speculative at this point. Some suspect that it may enhance melting, but that remains reasonable at this point. Well, if warming only meant nice comfortable days, we'd all be in favor! Unfortunately, the good side effects--and there are some--come with bad ones, too. 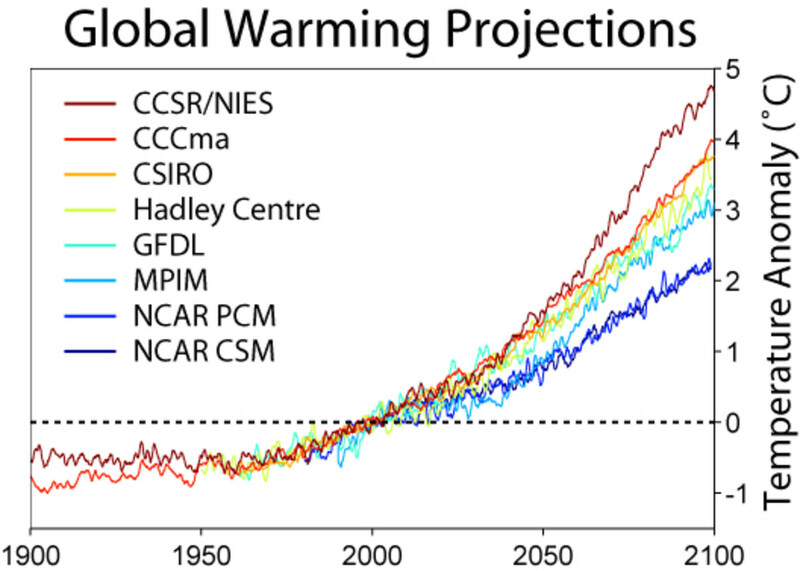 And the longer we allow warming to continue, the more the bad ones will tend to predominate. Don't mean to bring you down here, but you did (implicitly) ask what there was to worry about. Just saying we have many more important things to worry about these days, I don't see the problem, the earth population is growing, we need more land with warmer weather to sustain life..............maybe its a good thing?.............its been damn cold here this winter and I'm ready for some of that melting! Thanks for both kind words and interesting links, Larry! Nicely done,summarizing new physical-science research to answer the hovering question "So what?" These surveys are part of ongoing research on public views of science and environment. 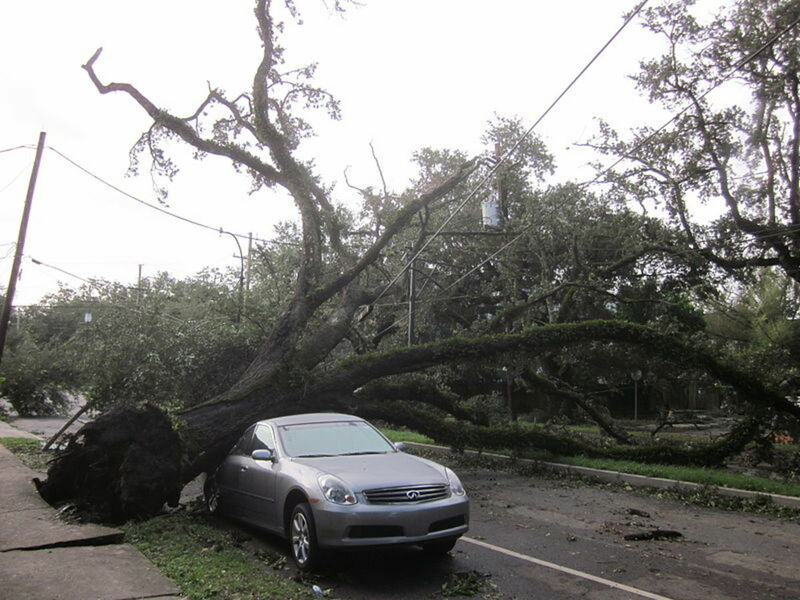 Moreover, the dramatic sudden loss we are seeing is well beyond the bounds of natural variability. It's too big and too sudden to occur by chance. So we've got the kind of melt one would expect--well, worse, actually; this was under-predicted--and a known potential cause. We know of nothing else sufficient to cause such an effect. The only reason to doubt what's happening is that we don't like the answer the evidence is giving us. That's understandable, but won't affect the outcome. Finally, you are correct that man can't control weather. However, we can influence it, by "loading the climate dice," as Dr. James Hansen of NASA puts it. Weather is mathematically chaotic, hard to predict very far in advance. But climate is not--it is weather 'averaged out.' When we change the composition of the atmosphere, we change the way it tends to act. I do not believe we can take several years and make bold determinations concerning global warming or cooling (as it was in the 70s) Folks need to remember we had record heat waves in the 30s that haven't been broken to date. We had record snow falls that haven't been broken either................its just nature........watch a hurricane or tornado and tell me man can control weather! Thanks for reading "Looking Forward, Looking Back." Do you have expectations of this melt season? Reactions to last September? Or maybe a lesson learned that I haven't included here?